Frequent rainfall has delayed harvest across the state, leading to concerns about whether manure application will be completed. The projected favorable forecast the next nine days should provide an opportunity for manure application. 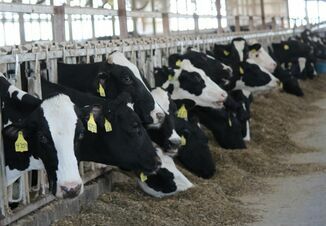 At this point, focus needs to shift from waiting for ideal manure application conditions, to making sure there is sufficient storage capacity to make it through the winter. However, as these weather conditions can increase nutrient transport and loss, it is important to make sure best manure application strategies are followed to minimize negative environmental impacts and ensure producers benefit from the manure’s fertilizer value. Increased soil moisture increases both the risk of runoff and manure movement to tile lines. Higher soil moistures lead to both slower infiltrations of applied manures and greater potential for leaching. 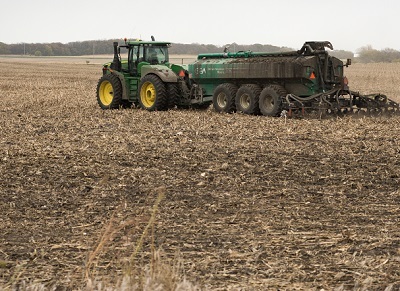 Liquid manure applications will increase soil moisture further; for example, a manure application of 13,500 gallons per acre is equivalent to a half-inch rainstorm. There are some things producers can do to minimize risk of nutrient loss. Consider reducing manure application rates. This may mean supplementing fertilizers or providing a second manure application in the spring to meet nutrient application goals, but the soil has a better chance of holding all the nutrients applied. Pick and choose your fields. All fields aren’t created equal. Some have more slope, some are closer to streams and rivers, and some are naturally wetter and more poorly drained. Take advantage of knowing the farm and apply in the drier locations. Follow the contour. Wetter soils mean the manure soaks in slower; the manure and those nutrients need to stay where they are put. Following the contour provides less opportunity for flow and decreases mini-micro topography that runoff from the field from rainfall events shortly after manure application. Surface residue. Fields with more residue cover will tend to have less runoff and less erosion than fields where residue has been removed. Take advantage of this by putting manure where residue cover remains. Increase setback distances from rivers, streams, lakes, and sinkholes. Review your manure management plan. Identify fields that have a low phosphorus index and apply to those first. This normally means the field is at a lower risk of nutrient loss. Watch the forecast. The highest risk time for nutrient transport is within the first 48-hours of manure application. Try to avoid applying if larger storms (greater than 0.5 inches) are forecast. These practices don’t eliminate risk of nutrient loss, but taking these actions can help keep the nutrients in the fields and out of Iowa’s waters. Finally, wet conditions always lead to concerns and questions about compaction. Check tire inflation pressures, only partially fill tanks, or consider drag line application to reduce compaction risk. 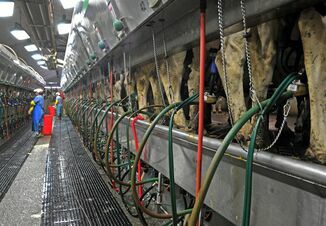 Good manure storage management means making sure to have sufficient capacity to make it spring. Keep soil and weather conditions in mind, and focus on actions to protect Iowa’s waters. Safe hauling.